The newly launched OSCRE Center for Innovation and Leadership will focus on innovative perspectives, methodologies and technologies that drive real change for commercial real estate. It will also explore the evolving and expanding role of information exchange standards and their importance in building an effective approach to data governance. Check it out. The Earthquake Engineering Research Institute, in collaboration with the Southern California Earthquake Center (SCEC), will convene the Eleventh National Conference on Earthquake Engineering (11NCEE), in Los Angeles, California, June 25-29 2018, with the theme of “Integrating Science, Engineering and Policy.” The deadline for papers is June 25. Download the Call for Papers. The National Institute of Building Sciences is gearing up to deliver the sixth iteration of the industry’s only all-inclusive Conference where members of the entire building community come together to connect, collaborate and create solutions that benefit the built environment. 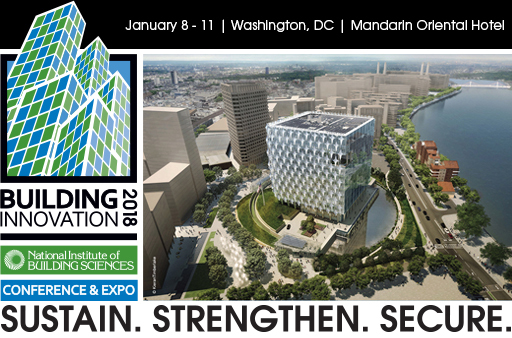 Building Innovation 2018: The National Institute of Building Sciences Sixth Annual Conference and Expo will take place January 8-11, 2018, at the Mandarin Oriental in Washington, D.C. The goal for the Conference is to explore strategies to Sustain. Strengthen. Secure. With preparations underway, the Institute’s Conference Planning Team is reaching out to Institute council and committee members and inviting industry professionals to present during the four-day Conference. Industry leaders with valuable insights, case studies, best practices, lessons learned and/or remaining challenges are encouraged to share their knowledge and experiences with the broad audience of building industry stakeholders. Abstracts are due Friday, June 16. Find out more. Jim. 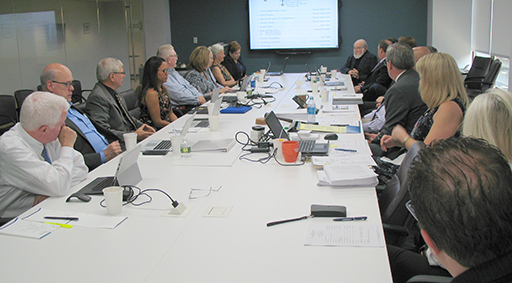 W. Sealy, FAIA (top right), past chair of the National Institute of Building Sciences Board of Directors and current chair of the Institute’s Building Seismic Safety Council (BSSC), says farewell to the Institute Board May 18. Sealy, who was in town to give his last BSSC presentation at the Coordinating Council’s May 17 meeting, is officially retiring after practicing architecture for 55 years. The “big-time Dallas architect” has actively participated in Institute programs since the mid-90’s. James R. Cagley, PE, SE, the current vice chair of the BSSC, will take over as chair. Sealy has participated on dozens of committees throughout his career. Known for his epic knowledge of building codes and regulations, Sealy mentored a vast number of code officials and industry practitioners. He has an immense history in codes, having worked with all of the legacy model code organizations. His words of wisdom and entertaining stories will be greatly missed on the BSSC, the Coordinating Council and across the Institute. The Board, staff and volunteers all wish him the best in his retirement. Read more about Sealy’s career. The National Institute of Building Sciences has earned recognition as a Preferred Education Provider by the International Code Council (ICC). By becoming an ICC Preferred Education Provider, the Institute can now offer the nation’s building safety professionals, among them more than 40,000 ICC-certified individuals, an opportunity to attend approved Institute courses and earn credit for their continuing education. From seismic safety and multihazard mitigation to sustainable buildings and off-site construction, the Institute works on a wide array of topics to improve the safety and performance of buildings. Code officials are active in many National Institute of Building Sciences activities, serve on the Institute’s Board of Directors and participate on various councils, committees and projects. As an ICC Preferred Provider, the Institute will now be able to provide building safety professionals with credit for participating in approved education programs relating to such topics. Learn more about the ICC Preferred Provider Program. During the April 20 Roundtable on Utilization of Public-Private Partnerships in the United States, Former Commissioner of the General Services Administration Public Building Service Dorothy Robyn (third from left) provides her perspective on current challenges to using such an approach. 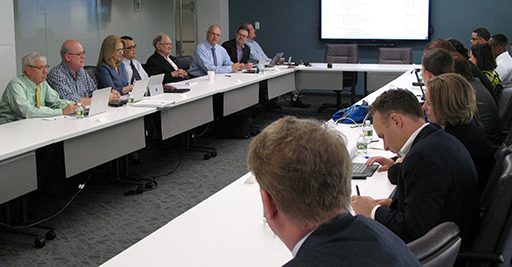 The National Institute of Building Sciences and the Royal Institution of Chartered Surveyors held the roundtable to continue their joint effort to identify opportunities to utilize public-private partnerships to achieve federal building life-cycle performance. Representatives from the Institute's Low Vision Design Committee (left to right): Chair Edd Soenke, AIA; Staff Director Stephanie Stubbs, Assoc. AIA; Nancy Clanton, PE, and Dr. Dennis Siemsen, OD, pause for a pose after presentation of "Designing Environments for Low Vision: Tools & Techniques" seminar April 28 at the American Institute of Architects (AIA) National Convention in Orlando, Florida. The session received an overall rating of 4.33 out of 5 (despite a 7:00 am start time!). View the Design Guidelines for the Visual Environment. Each May, jurisdictions across the nation celebrate Building Safety Month to educate the public about solutions that improve the safety, sustainability and resiliency of buildings, infrastructure and communities. On May 18, during the National Institute of Building Sciences Board Meeting, in Washington, D.C., Institute Chairman Stephen T. Ayers, FAIA, LEED AP, signed the Institute’s Building Safety Month proclamation. The Institute is a supporting sponsor of Building Safety Month and participated in several events throughout May in recognition of the month-long celebration. Read the proclamation. Chairman Bob Horner (top, third from right) addresses members of the Consultative Council during their May 16 meeting. The council members discussed their next steps for distributing the findings from the 2016 Moving Forward report, which came out in January, and presented potential topics for the 2017 edition. View the 2016 report. The National Institute of Building Sciences Building Seismic Safety Council (BSSC) will host the fourth webinar in its 2017 series sponsored by the Federal Emergency Management Agency (FEMA). The free webinar, “Seismic Design of Composite Steel and Concrete Structures,” will be held Friday, June 2, 2017, from 2:00 pm to 3:00 pm ET (11:00 am to 12:00 pm PT). Composite steel and concrete lateral force resisting systems are not commonly used as the primary lateral force-resisting system in regions of high seismicity. Presenter Robert G. Pekelnicky, PE, a member of BSSC’s Provisions Update Committee and chair of the BSSC Project 17 Committee’s Acceptable Risk Work Group, will discuss one particular type of composite steel and concrete lateral force resisting system—the composite partially restrained moment frame (C-PRMF). The moment frame is created by using the composite floor slab and a seat angle attaching the bottom of the steel beam to the steel column. As part of the presentation, Pekelnicky will show an example of this system. Learn more about the webinar. Register today! 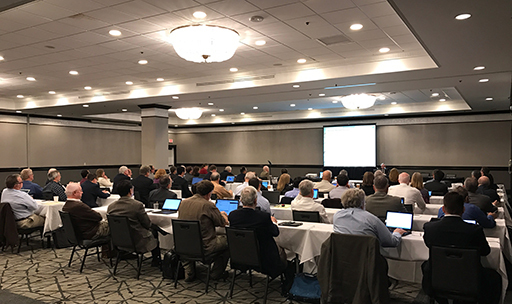 Structural engineers, building officials, government representatives and members of the earthquake community gathered together April 11 in Burlingame, California, to address seismic hazard mapping. The National Institute of Building Sciences Building Seismic Safety Council (BSSC) Project 17 (P17) Committee sponsored the Project 17 Workshop on Seismic Hazard Mapping with financial support from the Federal Emergency Management Agency (FEMA) and in coordination with the U.S. Geological Survey (USGS). The purpose of the workshop was to solicit input on important issues related to development of the next generation of seismic design value maps. A total of 62 people attended. Following the workshop, the P17 Committee and BSSC Provisions Update Committee (PUC) held committee meetings April 12-14 to work on developing the National Earthquake Hazard Reduction Program (NEHRP) 2020 NEHRP Recommended Seismic Provisions for New Buildings and Other Structures. Learn more about BSSC activities. The National Institute of Building Sciences Building Enclosure Technology and Environment Council (BETEC) and the Building Enclosure Council – Philadelphia are seeking abstracts for papers for presentation at the fifth BEST Conference Building Enclosure Science and Technology™ (BEST5), to be held April 16-19, 2018, in Philadelphia, Pennsylvania. BEST5 will be located at the historic Loew’s Hotel, aka the PSFS Building, the first International Style high-rise built in the United States. The BEST5 Technical Committee will select approximately 60 abstracts related to building science research, design or practice for conference papers and presentations, panel presentations and poster presentations. Presenters have until June 15, 2017, to submit a 300-word abstract online. During the three-day Conference, researchers and practitioners will share knowledge and lessons learned concerning the science and art of building enclosure. 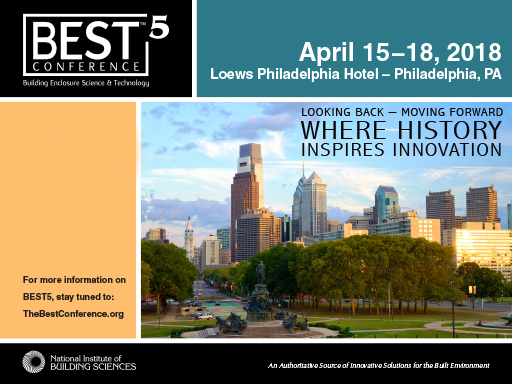 BEST5 will consist of concurrent technical sessions, plenary addresses, a BECx workshop and special programs highlighting Philadelphia’s building technology heritage. The Conference also will feature an exhibit hall with opportunities for one-on-one discussions with industry vendors of state-of-the-art building industry products and services. View the topics to be considered. Oak Ridge National Laboratories (ORNL) is looking for commercial buildings that are about to undergo retrofit where part of the retrofit (or the only retrofit) is to reduce the air leakage rate of the building. ORNL will conduct a blower door test before the retrofit and one after the retrofit at no cost. Information gathered on the building will be limited to generic information (such as size, number of stories, etc.) and the air leakage characteristics. No other information will be made public. This is a time-limited offer from ORNL. Have a building or know of a building that could be tested? Contact Ms. Diana Hun at ORNL. Oak Ridge National Laboratories (ORNL) has partnered with GAF to host a technology challenge on roofing systems. The challenge is part of the online crowdsourcing site, JUMP, and aims to identify innovation solutions for ensuring energy efficient and durable low-slope roofing systems employing concrete decks. The challenge is to develop new materials or installation methods that can be employed with a concrete deck so that the likelihood of having moisture-related problems is significantly reduced. The winner will receive $10,000 in cash (sponsored by GAF) and up to $20,000 of in-kind support from ORNL technical scientists. Ideas will be accepted through August 27, 2017. To learn more, attend the challenge webinar on June 29 from 2:00-3:00 pm ET. Register now. Congratulations to the 2017 U.S. Department of Energy (DOE) Race to Zero Student Design Competition winners, including Grand Winner Ryerson University and the University of Toronto. Thirty-nine teams presented their projects during the 2017 DOE Race to Zero Competition, April 22-23, at the National Renewable Energy Laboratory (NREL) in Golden, Colorado. View the results. The U.S. Community Preventive Services Task Force has issued a new recommendation, based on evidence from a systematic review of 90 studies, to increase physical activity through built environment approaches that combine transportation system interventions with land use and environmental design. It has become increasingly clear that the public health and medical sectors cannot successfully address the critical health challenges (as described in the paper) on their own. The Transportation Research Board and the National Academy of Medicine, as well as many professional associations (including those in the building industry) and the U.S. Surgeon General, supported the Task Force’s decision to review this evidence. Most importantly, the new recommendation recognizes and supports the importance of the transportation, land use and community design sectors in addressing these critical health challenges. Read the recommendations.